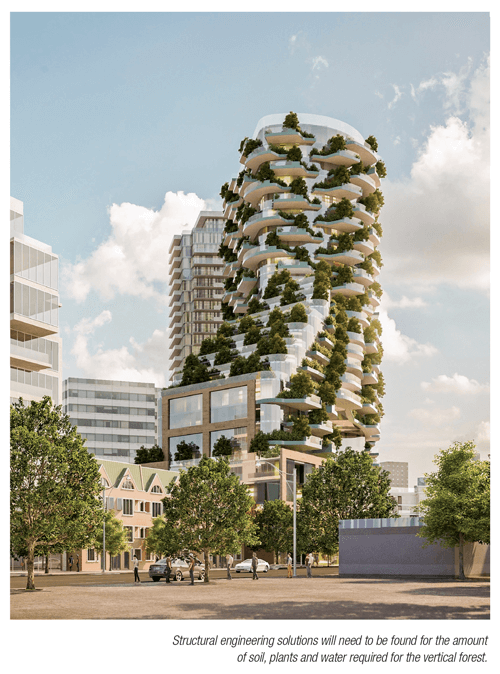 An architect firm and condo developer are planning Canada’s first vertical forest for Toronto, and they’ve brought together an impressive team of horticulturists, arborists, irrigation specialists and academics to make the ambitious project come to life. Cityzen Development Group and Brisbin Brook Beynon Architects, both based in Toronto, Ont., are working through the municipal approval process for Designers Walk, situated between the city’s posh Yorkville and Annex neighbourhoods. 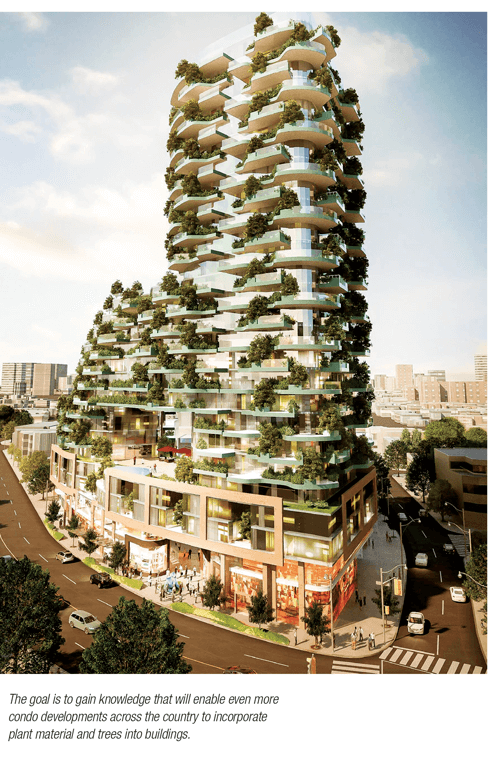 If the project is approved as planned, the “L” shaped, 27-story building will be home to some 500 trees (half deciduous, half coniferous) on extensive terraces and an open parkette. Artist renderings of the condo highlight just how unique this building would be in Toronto, a city which is increasingly dominated by cookie-cutter glass boxes. The images capture the imagination; as cities grow and population density increases, who wouldn’t prefer a green building over the monotony of glass and steel? Robert Wright, dean of forestry at the University of Toronto, and a landscape architect by training, has been in discussions with Brian Brisbin of BBB. To build and maintain suitable environments for plants and trees of this scale, on a condo of this size, with exposure in all four directions, will require incredible horticultural expertise, Wright says. However, he is optimistic that with the right group of academics, industry experts and researchers, Designers Walk could serve as a model for future developments. In addition to Wright, BBB Architects are working with researcher Darby McGrath of the Vineland Research and Innovation Centre in the Niagara, Ont., region; Milton, Ont.-based nursery PAO Horticultural; Milton- and Delhi, Ont.-based irrigation firm Vanden Bussche Irrigation; and arborist Michael Ormston-Holloway of The Planning Partnership in Toronto. All that soil, plants and water will require structural engineering solutions, as well. McGrath says vertical forests could be a major opportunity for Canadian nursery growers and landscape professionals, including the potential for new nursery products suited to the application. McGrath explained that funding for Vineland’s involvement will come in part from investments from the architect and the developer, and the organization will also be looking for public grants. There are current examples of vertical forests in China, Singapore and Italy. The Bosco Verticale building in Milan, Italy, provided inspiration for Designers Walk. BBB Architects partner Brian Brisbin went as far as to rent a unit in the building through AirBNB to get a closer look. The experienced led to an epiphany of sorts, he told the Toronto Star in a July, 2018 story. He had travelled to Europe, “to track down technology that’s about four miles from [his Toronto office].” The innovations that make a vertical forest possible — irrigation technology, advanced research into soil quality and volumes, leading urban forestry academics — are all found in the Greater Toronto Area. “Our structure has depressed slab areas that hold the trees in with irrigation components built all into one specialized system, which has never been done before,” Brisbin told The Star. Wright emphasized the importance of a long-term maintenance plan developed and implemented by highly skilled and knowledgeable horticulturists. Trees and plants must be selected and maintained with each specific microclimate in mind. Plans call for the 500 trees to be rooted two years ahead of time in woven, stainless steel planters. Once the condo is complete and the trees and plants have been installed, plans are in place to monitor and study how well they do. The larger goal, for both Wright and McGrath, is to gain knowledge that will enable even more condo developments across the country to incorporate plant material and trees into buildings. While the Designers Walk condo — based on its location in one of the most expensive neighbourhoods in Toronto — will be out of reach for all but the most well-heeled Torontonians, its success is important to more than just its future residents. If it works, and the horticulture is sound, it could serve as a model that could push the needle in Canada’s development industry. And that would be a very positive outcome for Canadians, the environment and horticulture professions.